Her eyes widened in perplexity. She looked at her staff and the team of volunteers. They had worked very hard and were ready to call it a day, but she could not ignore the passionate plea from these three women carrying their babies. The ceremony was winding down. Against the good judgment of her staff that it was already dusk and that scarcity of petrol had made commuting very difficult, she persuaded them gently to re-consider the decision. "We came here for these people. We cannot turn them back." 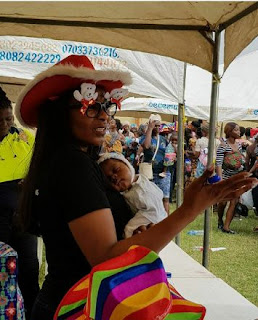 It was an appeal (not a command) from Mrs. Ibidunni Ighodalo, CEO of Elizabeth R, a top-notch events planning company and wife of Ituah Ighodalo, accountant and Senior Pastor of Trinity House. Persuading them with more soothing words, she moved ahead to make the women comfortable. Enveloping one of them in a hug, she took a baby from another. It was the first edition of the Ibidunni Ighodalo Foundation baby shower charity called, Baby's Day Out at the Open Field of the Millennium Housing Estate, better known as, Tinubu Estate in Ibeshe-Ikorodu, Lagos. The IIF had announced that the event was for pregnant women and children between one day and one year old, but the organisers were forced to observe this restriction more in the breach-elderly women, teenagers and single ladies showed up in their thousands to benefit from the IIF largesse. 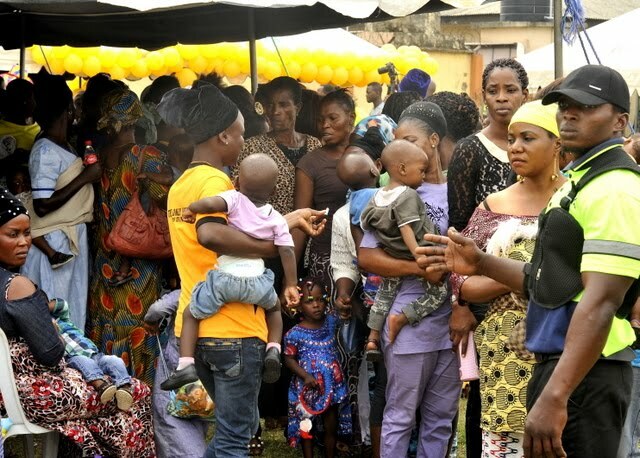 Though there was a captive population in the estate, a teeming number of people joined them from nearby and far-flung neighbourhoods around Ikorodu and beyond. Buses and trucks marked with the Trinity House and Elizabeth R insignia that carried various gift items were parked beside the field. Personnel from K-Square, a private security company were busy, trying to keep the children and their mothers from becoming unruly. There were two teams of men of the Nigeria Police keeping an eye on the crowd. Thank God, the situation never got out of control. By and large, the mild disruption was foisted on the event by parents who could not stay on the queue and excited children, who scampered to get a gift bag from Santa Claus. The handout from the IIF were in different categories. Pregnant women were given clothes, baby bath set, raw food items and a bag filled with baby toiletries. 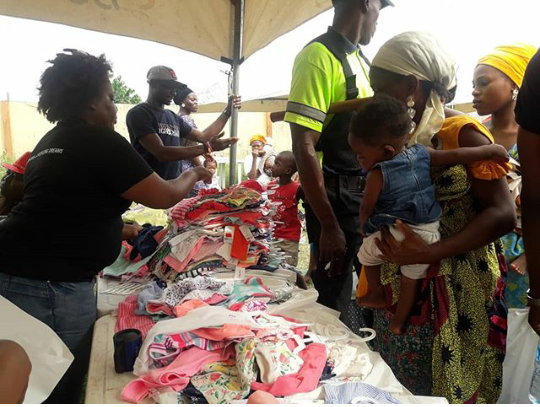 Though some mothers tried to shave some months off their grown babies, officials of IIF insisted on giving the baby clothes to the right recipient. For the baby cot bed, pregnant women took to the dance floor to dance to music from DJ Shexy in order to decide who will take it home. The elderly women smiled home with one live chicken and food items. Mrs. Ibijoke Adeboyejo said she was familiar with the charitable disposition of the Ighodalos since she worshipped under Pastor Ituah at the Redeemed Christian Church of God Christ Church, Gbagada. She got to know about the Baby's Day Out on Facebook. Mrs. Olayinka Mokwenye heard of the charity through a friend. A good number of the women were residents of the estate. Many of them had modest expectations when they were notified of the event. But it turned out that the organisers exceeded their expectations by far. Mrs. Bola Egbo, a teacher said she expected a children's party. "The crowd is too much," she said. Another teacher, Mrs. Sharon Uche who lives in the estate thought it was going to be a platform for evangelism. Her presumption was fulfilled in another way. "What the Ibidunni Ighodalo did was better than preaching and hitting people on the head with the Bible. They carried out practical Christianity." 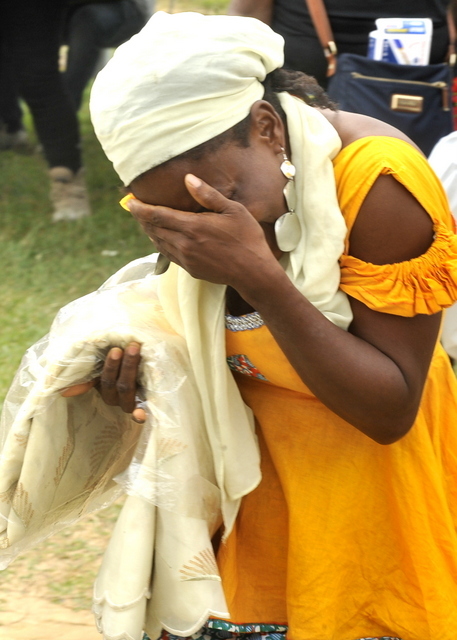 Mrs. Shakirah Lawal, a Medical Laboratory Scientist said she saw much more than she expected. 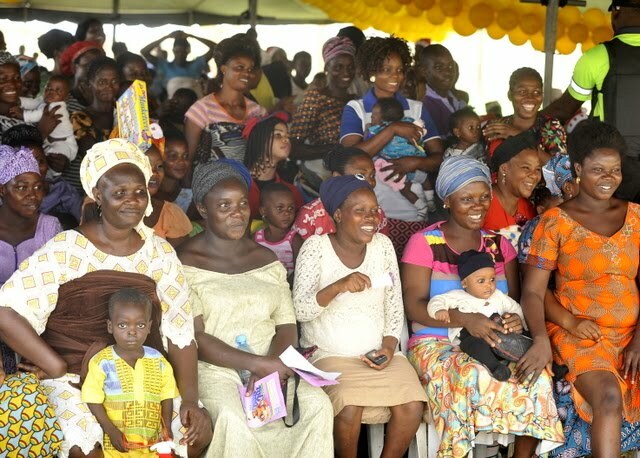 Mrs. Florence Uju confessed that the IIF came with loads of gifts, but advised that they should be better organized next time. Perhaps, the luckiest of the women was Mrs. Jennifer Ojukwu who was vising her sister in the estate. As a pregnant woman, she was not only gifted with items for her unborn baby and herself, her four children also went home with gifts. An IIF spokesperson said the organization was growing fast and was beginning to accommodate responsibilities which were not part of its original obligation. "We set out to help couples who were challenged with conception. It was a simple obedience to God. When you walk with God, you do not know where He is taking you. You just follow Him in complete trust and surrender. God is opening new horizons. Everything is related. When couples conceive, the next thing is a baby. The expansion of our mission is within rational progression."